In this guide, we’ll show the basics of cryptocurrency day trading and the easiest day trading strategies. You will learn how to use them in the volatile market of cryptocurrencies. We will explain terms and trade functions so that beginners can start day trading without fear of incurring substantial losses. We will show how to trade cryptocurrency with a step-by-step guide. 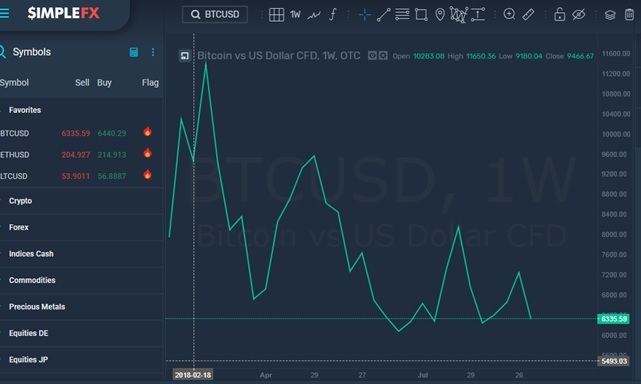 SimpleFX’s WebTrader is an easy-to-pick-up tool, and perfect for learning the basics of bitcoin day trading strategies. Cryptocurrencies are traded differently from other centralized assets, Forex and stocks included. Due to lax regulation and decentralized nature, bitcoin trading relies on market trends entirely, while governmental institutions have low impact power. The cryptocurrency price is also extremely volatile, which makes it a perfect instrument for CFD day trading. A crypto trader can profit from large price fluctuations. Take the present situation for example. On 5 September, the price of the bitcoin declined from approximately $7.400 down to $6.400 on the very next day. During the next three days, the price fluctuated between $6.400 and $6.200. To limit risks associated with day trading strategy, investors need to do detailed analysis on an hourly basis. Through short-term research, traders can detect these small trends and use appropriate orders. Day trading is thus one of the best strategies when investing in volatile markets, such as cryptocurrencies. 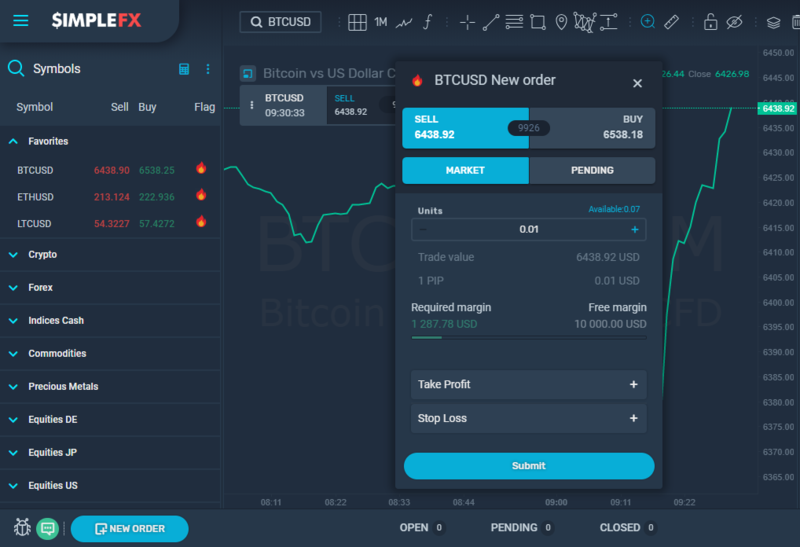 How to trade bitcoin on a CFD platform, such as SimpleFX WebTrader? The concept of day trading cryptocurrency with CFDs (Contracts for Difference) is simple. Traders form a “contract” with the company by creating instructions without an actual order. CFD platform does it in their name instead. Through orders, a trader specifies time and prices upon which investment should be carried out. 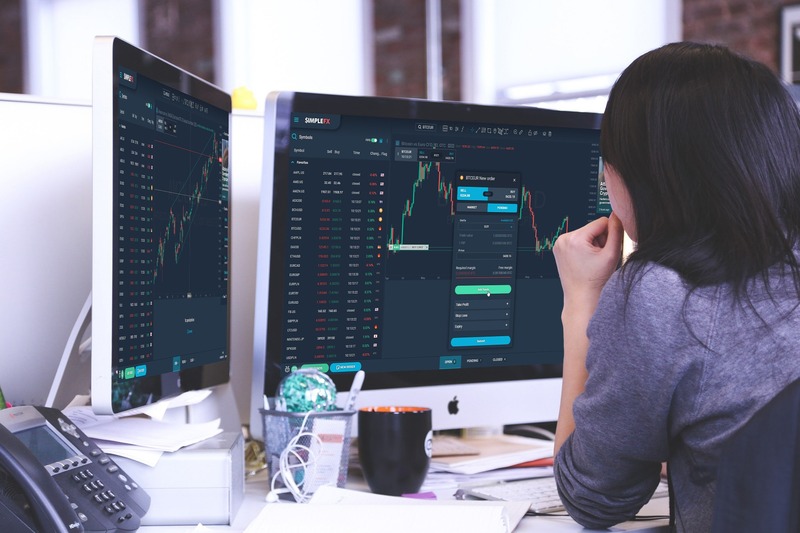 The major benefit of a CFD marketplace, such as SimpleFX, is the lack of ownership claims on cryptocurrencies during the process. It makes it easier for the beginners to capitalize on the price difference in time. At the same time, SimpleFX would carry out all necessary processes for trade to find its way in the market instantly. What Makes an Expert in Trading? How to trade bitcoin as a pro? Skilled traders always have several strategies and tactics under their sleeve. In different situations, various strategies would perform better, depending on the market trends. Before we delve deeper into day trading styles, we need to explain the concept of buying and selling orders. Buying order is where trader predicts that price value shall rise. The other is selling order, where trader predicts that price value shall decline. 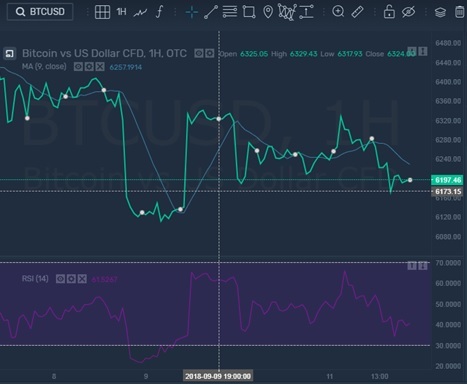 Charts help bitcoin day traders determine the trend with indicators set to track down and record situations that can predict the future value of the digital coin. You can find each one of them on SimpleFX WebTrader. These offer the roadmap of the coin trading, translating the ups and downs into a trend that you can capitalize on. Trend Trading is one of the most popular day tactics for cryptos, as it follows the general movement of the market. If the price goes down, the trader would create an sell order to capitalize when the value goes further down. back up. Counter-Trend Trading is a lot riskier approach then trend trading. An investor has to predict when and how strong the market will move in opposite position. Range Trading is something in between first two tactics, with traders “dancing” between two prices. It is used when market fluctuations move both ways in a short period of time. Reaction Trading is somewhat a mix of all three, with a difference in the analysis. The three above styles use technical analysis through price/volume chart analysis, while reaction trading does not. It focuses on speed due to how volatile crypto market is. In a matter of minutes, bitcoins price can decline from $6.200 down to $6.000, only to climb back to $6.300. In that period, there is no time for the complex thought process leaving the traders to use their unique experience. 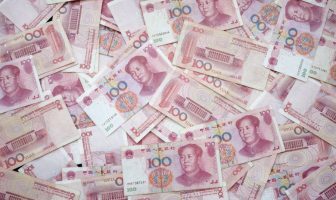 First, three-day trading strategies would work for beginners in cryptocurrency investment. They are easy to understand and implement in the market. The final, reaction tactic is reserved for experienced investors, who have accumulated both large losses and profits over a year or two. There is no best day trading style, as these follow a different route when trading on market movements. How to invest in cryptocurrency without suffering large losses? The use of several functions is crucial in limiting excess losses and balance’s wipeout. These are called stop functions, including stop-loss and take-profit, as shown on SimpleFX WebTrader’s snapshot below. By setting the upper and lower limit, trader instructs SimpleFX to close the order when the price reaches a certain value. It saves the investor from suffering loss due to extreme market conditions. Apart from price limitations, traders can use leverage. CFD platforms let you borrow additional coins to increase the power of the trade. SimpleFX is one of the market leaders offering up to 1:500 leverage, which adds 500 times bigger balance to your order. It increases your gains at times when your balance is insufficient to carry out such large investments. Due to large risks, a leverage tool has, a negative balance protection (NBP) is crucial. It limits the liability of investors funds down to what their balance on the platform holds. The limitation on the losses is automatic, without a need for the user to set up anything in regards to NBP. Opening a CFD account at SimpleFX is straightforward. You just need an email and a password, without a need for identity verification. Through email confirmation, users can actively trade cryptos under 5 minutes from the start of registration. Trading at SimpleFX is different from other platforms since all accounts retain the anonymity of their identity. Depending on the desired platform, traders can download desktop and mobile app versions or use SimpleFX’s WebTrader through browsing. To start trading, a deposit of funds is needed, either through cryptocurrencies or through fiat assets. Deposit process is quite simple and instant. Cryptocurrency payments take several minutes to deposit. 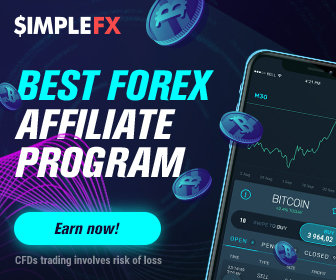 At SimpleFX we do are best to speed the transaction and we add funds after receiving 1 blockchain network confirmation. Available deposit methods include coins (Bitcoin, Ethereum, Litecoin, Bitcoin Cash, and Dash), Fasapay, Skrill, and Neteller. Over 10 fiat currencies are accepted as well. Once the account is finalized, users can create buy or sell orders. Looking at the interface below, clients can create an order at a moment’s notice. Depending on the market movement and utilize functions available. The most important of those are loss/profit limits and leverage. At SimpleFX WebTrader, no matter the chosen platform, leverage of 1:500 is available, as explained in the previous section. As the order is filled out, just click on “Submit” button to approve it. The same goes with the closure, where a click on “X” finalizes the order, drawing a result regarding profit or loss. Apart from the orders, you also have trades and positions, both providing important information that you should be aware of. Trades are a result of an order made, be it a loss or a profit. Positions, on the other hand, are a sum of all trades made in a specific time period (a day). Through positions, you can see orders and trades. 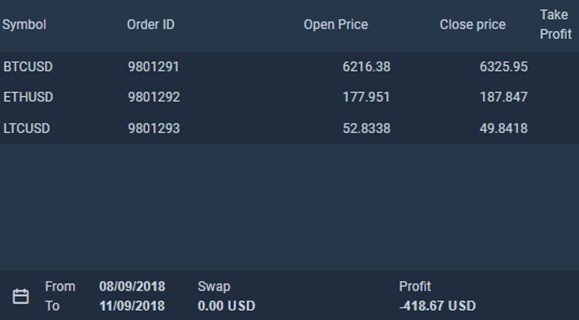 They sum up to your overall daily profit (or loss), as you can see in the snapshot above. The last tool that expert crypto traders should make use of is Simple & Safe API manager. The software allows the user to plug in several trading tools. You can combine functions, chart analysis, and balance transfers into one command. This function is meant for more experienced traders and is very useful reactive day trading. And that is about it regarding SimpleFX day trading! 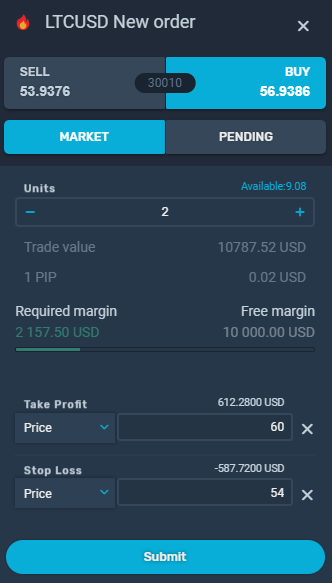 We would encourage clients to check out and use our demo feature, allowing you to create orders, use day strategies, and experience profit/loss in real time without risks. Stay tuned for our future lessons regarding crypto trade for beginners. Should you have questions regarding this guide, do not hesitate to leave a comment below or write to us directly. Next Article How to mine cryptocurrency? Which crypto should I mine?